Once again, Crestview Local Schools and Lincolnview Local Schools have joined together in a two-year pilot program sponsored in part by Tri-County Mental Health to share a licensed social worker within both districts. Jennifer Daugherty, a resident of Van Wert County, whose services will be purchased through Western Buckeye Educational Service Center, has been selected for this new position and will begin her responsibilities on November 1. “I am excited to serve both school districts and their respective communities. This type of work is important to me,” comments Daugherty. 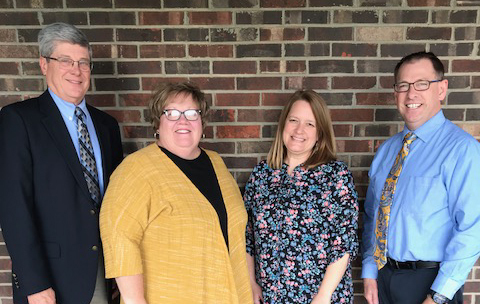 Western Buckeye ESC Superintendent Dave Bagley, Crestview Superintendent Kathy Mollenkopf and Lincolnview Superintendent Jeff Snyder welcome Jennifer Daugherty to her new position as social worker for both schools.